Ramadhaan themed work produced by students at Tuition Club! 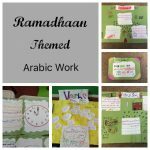 Pupils have been making some wonderful Ramadhaan themed posters in Arabic, outlining key areas associated with Ramadhaan and what it entails. Students have presented posters in the Arabic language showing a day in Ramadhaan and what it means to them and their families.